The Carlisle 4119809 Spectrum® wand brush is long and narrow, so it can be used to clean hard-to-reach areas like coils in refrigerated equipment, conveyer belts, and countertops. Resistant to chemicals, the heavy-duty polyester bristles do not bend. 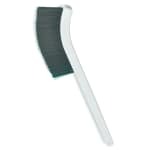 Since the bristles are green, they can be used in color-coded systems for a specific task or area, and the polypropylene handle on the Carlisle 4119809 Spectrum wand brush resists cracking and breaking.